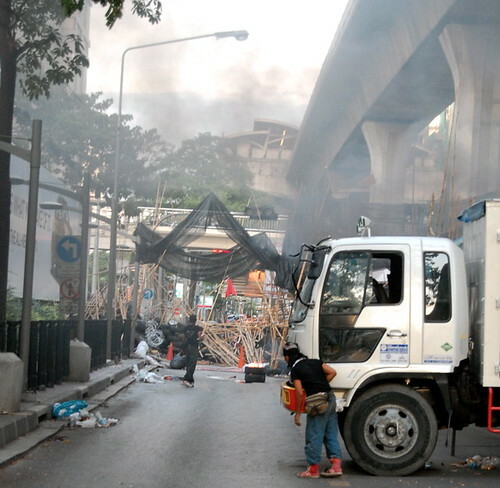 The latest news on the red shirt protests here in Bangkok is this: The army continues to enforce its blockade of the protest zone at Rajaprasong, in the center of the city. And demonstrators continue to attack the soldiers’ positions. Here’s a recent AP story on failed talks between red leaders and the government. I can now hear, off in the distance, pops and bangs coming from the Rama IV and Silom areas of the city, to the south of the protest site. This is, among other locations, where many of the clashes have occurred. 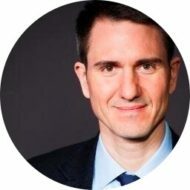 Whether these sounds are from fireworks or gunfire is unclear to me. In addition to other weapons, red shirts have been firing firecrackers and bottle rockets at the soldiers, and the army has been defending their positions with live fire. For more on the situation, here’s a BBC gallery of images, and here are some photos at TIME.com from photographer James Nachtwey. Also, this Atlantic piece sums up what’s happening in Thailand. And for an essay about the recent violence, I suggest checking out this NYT piece by Tom Fuller, who was near “Seh Daeng” when the rogue army general was shot last week. I snapped most of these about five hours ago today (Tues.), just after 6 p.m. local time. 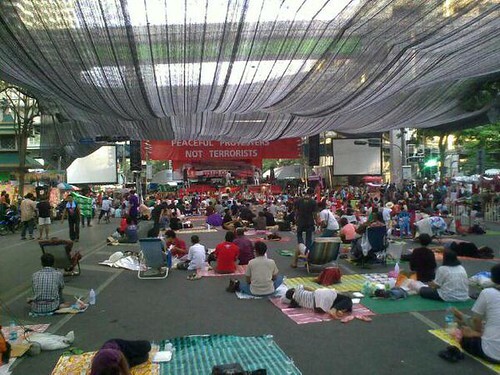 I spent some time at the Rajaprasong stage — here’s what the crowd looked like at about 5:30 p.m. The numbers here have fallen over the past few days. 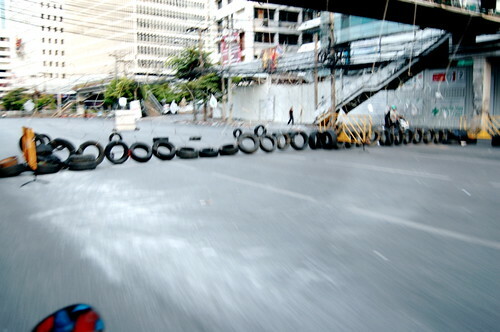 Standing from a barrier that the red shirts have constructed on Phloenchit Rd. to my right, here’s the view of Langsuan Rd. 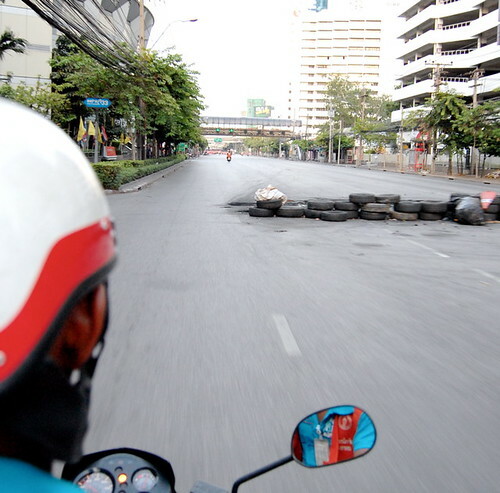 Looking up Phloenchit toward a second red shirt barrier on Wireless Rd. I was unable to identify the source of the smoke. 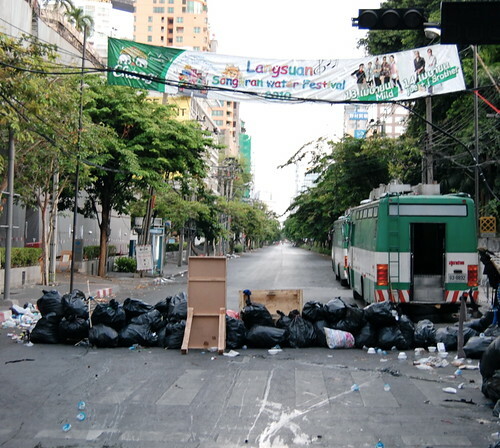 A hastily snapped image of a barricade on Phetburi Rd. There has also been fighting in this area. 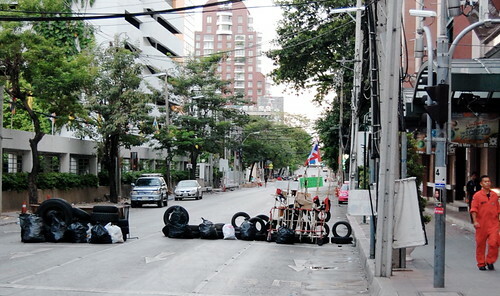 Another barrier on Phetburi Rd. 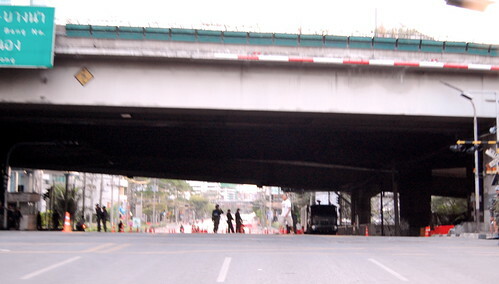 Approaching an army checkpoint on Phetburi Rd. and Nana. All of these images are in the full Flickr photoset. As I noted at the time on Twitter, I later noticed that soldiers have set up a checkpoint with sandbags in the median of Phloenchit, near Mahatun Plaza. Great post, Newley. Thanks. Meaningful images and commentary.